« Feeling A Whole Lot Like December! Pretty nice day today. It is supposed to be in the low 50s, but that might be pushing it. A little overcast, but no wind. 40s the rest of the week and chances for rain by the weekend. Next week looks like more 40s with some 30s scattered here and there. Low generation both days this past weekend. it was really a good level for wade fishing in many areas. Today, however, it back to 2-3 units for a few hours in the morning then ramping it down to one +/- units. Stan on the water Friday with Jon from Texas. What a cold day! Only good thing about the day was that it wasn’t as cold as the day before. Good day for them fishing, however, on the ruby 2 under the big ruby. It turned out to be a little shorter than our normal half day as both of them had frozen fingers. The saving grace was the hot soup as the end of the trip!! 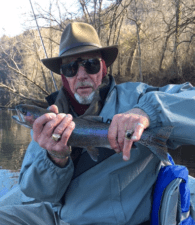 This entry was posted on Monday, December 12th, 2016 at 1:14 pm	and is filed under Fishing Reports. You can follow any responses to this entry through the RSS 2.0 feed. You can leave a response, or trackback from your own site.